The terms "Eastern" and "Western" in this regard originated with geographical divisions in Christianity mirroring the cultural divide between the Hellenistic east and Latin West, and the political divide between the Western and Eastern Roman empires. Because the largest church in the East is the body currently known as the Eastern Orthodox Church, the term "Orthodox" is often used in a similar fashion to "Eastern", to refer to specific historical Christian communions. However, strictly speaking, most Christian denominations, whether Eastern or Western, consider themselves to be "orthodox" (following correct beliefs) as well as "catholic" (or "universal"), as two of the Four Marks of the Church listed in the Nicene-Constantinopolitan Creed: "One, Holy, Catholic and Apostolic" (Greek: μία, ἁγία, καθολικὴ καὶ ἀποστολικὴ ἐκκλησία). There are several liturgical rites in use among the Eastern churches (excepting the non-liturgical dissenting bodies). These are the Alexandrian Rite, the Antiochene Rite, the Armenian Rite, the Byzantine Rite, the East Syriac Rite and the West Syriac Rite. Eastern Christians do not share the same religious traditions, but do share many cultural traditions. Christianity divided itself in the East during its early centuries both within and outside of the Roman Empire in disputes about Christology and fundamental theology, as well as national divisions (Roman, Persian, etc.). It would be many centuries later that Western Christianity fully split from these traditions as its own communion. Major branches or families of Eastern Christianity, each of which has a distinct theology and dogma, include the Eastern Orthodox Church, the Oriental Orthodox communion, the Eastern Catholic Churches, the Assyrian Church of the East, the Ancient Church of the East, and the Mar Thoma Syrian Church. In many Eastern churches, some parish priests administer the sacrament of chrismation to infants after baptism, and priests are allowed to marry before ordination. While all the Eastern Catholic Churches recognize the authority of the Pope of Rome, some of them who have originally been part of the Orthodox Church or Oriental Orthodox churches closely follow the traditions of Orthodoxy or Oriental Orthodoxy, including the tradition of allowing married men to become priests. The Eastern churches' differences from Western Christianity have as much, if not more, to do with culture, language, and politics, as theology. For the non-Catholic Eastern churches, a definitive date for the commencement of schism cannot usually be given (see East–West Schism). The Church of the East declared independence from the churches of the Roman Empire at its general council in 424, which was before the Council of Ephesus in 431, and so had nothing to do with the theology declared at that council. Oriental Orthodoxy separated after the Council of Chalcedon in 451. Since the time of the historian Edward Gibbon, the split between the Church of Rome and the Orthodox Church has been conveniently dated to 1054, though the reality is more complex. This split is sometimes referred to as the Great Schism, but now more usually referred to as the East–West Schism. This final schism reflected a larger cultural and political division which had developed in Europe and Southwest Asia during the Middle Ages and coincided with Western Europe's re-emergence from the collapse of the Western Roman Empire. The Ukrainian Lutheran Church developed within Galicia around 1926, with its rites being based on the Liturgy of St. John Chrysostom, rather than on the Western Formula Missae. The Eastern Orthodox Church is a Christian body whose adherents are largely based in the Middle East (particularly Syria, Lebanon, Jordan, Israel, and Palestine) and Turkey, Eastern Europe and the Caucasus (Georgia, Abkhazia, Ossetia etc. ), with a growing presence in the western world. Eastern Orthodox Christians accept the decisions of the first seven ecumenical councils. Eastern Orthodox Christianity identifies itself as the original Christian church (see early centers of Christianity) founded by Christ and the Apostles, and traces its lineage back to the early Church through the process of apostolic succession and unchanged theology and practice. Distinguishing characteristics of the Eastern Orthodox Church include the Byzantine Rite (shared with some Eastern Catholic Churches) and an emphasis on the continuation of Holy Tradition, which it holds to be apostolic in nature. The Eastern Orthodox Church is organized into self-governing jurisdictions along geographical, national, ethnic or linguistic lines. Eastern Orthodoxy is thus made up of fifteen or sixteen autocephalous bodies. Smaller churches are autonomous and each have a mother church that is autocephalous. All Eastern Orthodox are united in doctrinal agreement with each other, though a few are not in communion at present, for non-doctrinal reasons. This is in contrast to the Catholic Church and its various churches. Members of the latter are all in communion with each other, parts of a top-down hierarchy (see primus inter pares). The Eastern Orthodox reject the Filioque clause as heresy, in sharp contrast with the majority of Catholics. Yet some Catholics who are not in communion with the Catholic Church side with the Eastern Orthodox here and reject this teaching, putting them in theological disagreement with the others. It may also be noted that the Church of Rome was once in communion with the Eastern Orthodox Church, but the two were split after the East–West Schism and thus it is no longer in communion with the Eastern Orthodox Church. It is estimated that there are approximately 240 million Eastern Orthodox Christians in the world. Today, many adherents shun the term "Eastern" as denying the church's universal character. They refer to Eastern Orthodoxy simply as the Orthodox Church. Oriental Orthodoxy refers to the churches of Eastern Christian tradition that keep the faith of the first three ecumenical councils of the undivided Christian Church: the First Council of Nicaea (AD 325), the First Council of Constantinople (381) and the Council of Ephesus (431), while rejecting the dogmatic definitions of the Council of Chalcedon (451). Hence, these churches are also called the Old Oriental churches. They comprise the Coptic Orthodox Church, the Eritrean Orthodox Tewahedo Church, the Ethiopian Orthodox Tewahedo Church, the Jacobite Syrian Church of Antioch and the Armenian Apostolic Church. Oriental Orthodoxy developed in reaction to Chalcedon on the eastern limit of the Byzantine Empire and in Egypt, Syria and Mesopotamia. In those locations, there are also Eastern Orthodox patriarchs, but the rivalry between the two has largely vanished in the centuries since the schism. The twenty-three Eastern Catholic Churches are in communion with the Holy See at the Vatican despite being rooted in the theological and liturgical traditions of Eastern Christianity. These churches were originally part of the Orthodox East, but have since been reconciled to the Roman Church. Many of these churches were originally part of one of the above families and so are closely related to them by way of ethos and liturgical practice. As in the other Eastern churches, married men may become priests, and parish priests administer the mystery of confirmation to newborn infants immediately after baptism, via the rite of chrismation; the infants are then administered Holy Communion. 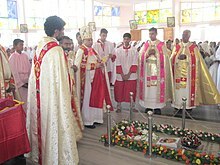 The Syro-Malabar Church, which is part of the Saint Thomas Christian community in India, follows East Syriac traditions and liturgy. Other Saint Thomas Christians of India, who were originally of the same East Syriac tradition, passed instead to the West Syriac tradition and now form part of Oriental Orthodoxy (some from the Oriental Orthodox in India united with the Catholic Church in 1930 and became the Syro-Malankara Catholic Church). The Maronite Church also claims never to have been separated from Rome, and has no counterpart Orthodox Church out of communion with the Pope. It is therefore inaccurate to refer to it as a "Uniate" Church. The Italo-Albanian Catholic Church has also never been out of communion with Rome, but, unlike the Maronite Church, it resembles Orthodox Church's liturgical rite. Historically, the Church of the East was the widest reaching branch of Eastern Christianity, at its height spreading from its heartland in Persian-ruled Assyria to the Mediterranean, India, and China. Originally the only Christian church recognized by Zoroastrian-led Sassanid Persia—through its alliance with the Lakhmids, the regional rivals to the Byzantines and its Ghassanid vassal—the Church of the East declared itself independent of other churches in 424 and over the next century became affiliated with Nestorianism, a Christological doctrine advanced by Nestorius, Patriarch of Constantinople from 428 to 431, which had been declared heretical in the Roman Empire. Thereafter it was often known, possibly inaccurately, as the Nestorian Church in the West. Surviving a period of persecution within Persia, the Church of the East flourished under the Abbasid Caliphate and branched out, establishing dioceses throughout Asia. After another period of expansion under the Mongol Empire, the church went into decline starting in the 14th century, and was eventually largely confined to its founding Assyrian adherent's heartland in the Assyrian homeland, although another remnant survived on the Malabar Coast of India. In the 16th century, dynastic struggles sent the church into schism, resulting in the formation of two rival churches: The Chaldean Church, which entered into communion with Rome as an Eastern Catholic Church, and the Assyrian Church of the East. The followers of these two churches are almost exclusively ethnic Assyrians. In India, the local Church of the East community, known as the Saint Thomas Christians, experienced its own rifts as a result of Portuguese influence. The Assyrian Church of the East emerged from the historical Church of the East, which was centered in Mesopotamia/Assyria, then part of the Persian Empire and spread widely throughout Asia. The modern Assyrian Church of the East emerged in the 16th century following a split with the Chaldean Church, which later entered into communion with Rome as an Eastern Catholic Church. The Church of the East was associated with the doctrine of Nestorianism, advanced by Nestorius, Patriarch of Constantinople from 428 – 431, which emphasized the disunion between the human and divine natures of Jesus. Nestorius and his doctrine were condemned at the Council of Ephesus in 431, leading to the Nestorian Schism in which churches supporting Nestorius split from the rest of Christianity. Many followers relocated to Persia and became affiliated with the local Christian community there. This community adopted an increasingly Nestorian theology and was thereafter often known as the Nestorian Church. As such, the Church of the East accepts only the first two ecumenical councils of the undivided Church—the First Council of Nicaea and the First Council of Constantinople—as defining its faith tradition, and rapidly took a different course from other Eastern Christians. The Church of the East spread widely through Persia and into Asia, being introduced to India by the 6th century and to the Mongols and China in the 7th century. It experienced periodic expansion until the 14th century, when the church was nearly destroyed by the collapse of the Mongol Empire and the conquests of Timur. By the 16th century it was largely confined to Iraq, northeast Syria, southeast Turkey, northwest Iran and the Malabar Coast of India (Kerala). The split of the 15th century, which saw the emergence of separate Assyrian and Chaldean Churches, left only the former as an independent sect. Further splits into the 20th century further affected the history of the Assyrian Church of the East. The Saint Thomas Christians are an ancient body of Christians on the southwest coast of India who trace their origins to the evangelical activity of Thomas the Apostle in the 1st century. By the 5th century the Saint Thomas Christians were part of the Church of the East, or Nestorian Church. Until the middle of the 17th century and the arrival of the Portuguese, the Thomas Christians were all one in faith and rite. Thereafter, divisions arose among them, and consequently they are today of several different rites. In addition to these four mainstream branches, there are a number of much smaller groups which, like Protestants, originated from disputes with the dominant tradition of their original areas, but are usually not referred to as Protestants because they lack historical ties to the Reformation, and usually lack a classically Protestant theology except if the Reformed Orthodoxy movement is counted in later centuries. Most of these are either part of the more traditional Old Believer movement, which arose from a schism within Russian Orthodoxy, or the more radical Spiritual Christianity movement. The latter includes a number of diverse "low-church" groups, from the Bible-centered Molokans to the anarchic Doukhobors to the self-mutilating Skoptsy. None of these groups are in communion with the mainstream churches listed above, aside from a few Old Believer parishes in communion with the Russian Orthodox Church Outside Russia. There are also national dissidents, where ethnic groups want their own nation-church, such as the Macedonian Orthodox Church and the Montenegrin Orthodox Church; both are domiciles of the Serbian Orthodox Church. Reformed Orthodox churches are a collection of Eastern Christian churches who adopted western Protestant elements since the 19th century. The most notable Reformed Orthodox churches are the Mar Thoma Syrian Church (which follows a mostly Oriental Orthodox identity with High Church worship with Anglican beliefs and traditions), the St. Thomas Evangelical Church (following an Oriental Orthodox identity with Evangelical beliefs) and smaller churches such as the Ukrainian Lutheran Church (which follows a Eastern Orthodox identity with Lutheran beliefs and traditions), Evangelical Baptist Union of Georgia (which follows Eastern Orthodoxy with Baptist beliefs) and Evangelical Orthodox Church (following Eastern Orthodoxy along with some traditions of Evangelicalism and Charismaticism). Byzantine Rite Lutheranism arose in the Ukrainian Lutheran Church around 1926. It sprung up in the region of Galicia and its rites are based on the Liturgy of St. John Chrysostom. The church suffered persecution under the Communist régime, which implemented a policy of state atheism. Starting in the 1920s, parallel hierarchies formed in opposition to local Orthodox churches over ecumenism and other matters. These jurisdictions sometimes refer to themselves as being "True Orthodox". In Russia, underground churches formed and maintained solidarity with the Russian Orthodox Church Outside Russia until the late 1970s. There are now traditionalist Orthodox in every area, though in Asia and the Middle East their presence is negligible. Ecumenical dialogue over the past 43 years since Pope Paul VI's meeting with the Orthodox Patriarch Athenagoras I has awoken the nearly 1000-year hopes for Christian unity. Since the lifting of excommunications during the Paul VI and Athenagoras I meeting in Jerusalem there have been other significant meetings between Popes and Ecumenical Patriarchs of Constantinople. One of the most recent meetings was between Benedict XVI and Bartholomew I, who jointly signed the Common Declaration. It states that "We give thanks to the Author of all that is good, who allows us once again, in prayer and in dialogue, to express the joy we feel as brothers and to renew our commitment to move towards full communion". In 2013 Patriarch Bartholomew I attended the installation ceremony of the new Roman Catholic Pope, Francis, which was the first time any Ecumenical Patriarch of Constantinople had ever attended such an installation. At a meeting in Balamand, Lebanon in June 1993, the Joint International Commission for the Theological Dialogue between the Catholic Church and the Orthodox Church declared that these initiatives that "led to the union of certain communities with the See of Rome and brought with them, as a consequence, the breaking of communion with their Mother Churches of the East … took place not without the interference of extra-ecclesial interests"; and that what has been called "uniatism" "can no longer be accepted either as a method to be followed nor as a model of the unity our Churches are seeking" (section 12). 3) Concerning the Eastern Catholic Churches, it is clear that they, as part of the Catholic Communion, have the right to exist and to act in response to the spiritual needs of their faithful. 16) The Oriental Catholic Churches who have desired to re-establish full communion with the See of Rome and have remained faithful to it, have the rights and obligations which are connected with this communion. 22) Pastoral activity in the Catholic Church, Latin as well as Oriental, no longer aims at having the faithful of one Church pass over to the other; that is to say, it no longer aims at proselytizing among the Orthodox. It aims at answering the spiritual needs of its own faithful and it has no desire for expansion at the expense of the Orthodox Church. Within these perspectives, so that there will be no longer place for mistrust and suspicion, it is necessary that there be reciprocal exchanges of information about various pastoral projects and that thus cooperation between bishops and all those with responsibilities in our Churches, can be set in motion and develop. There has been a significant Christian migration in the 20th century from the Near East. Fifteen hundred years ago Christians were the majority population in today's Turkey, Iraq, Syria, Lebanon, Jordan, Palestine and Egypt. In 1914 Christians constituted 25% of the population of the Ottoman Empire. At the beginning of the 21st century Christians constituted 6–7 percent of the region’s population: less than 1% in Turkey, 3% in Iraq, 12% in Syria, 39% in Lebanon, 6% in Jordan, 2.5% in Israel/Palestine and 15–20% in Egypt. As of 2011 Eastern Orthodox Christians are among the wealthiest Christians in the United States. They also tend to be better educated than most other religious groups in America, having a high number of graduate (68%) and post-graduate (28%) degrees per capita. Christians especially Nestorian contributed to the Arab Islamic Civilization during the Ummayads and the Abbasids by translating works of Greek philosophers to Syriac and afterwards to Arabic. They also excelled in philosophy, science (such as Hunayn ibn Ishaq, Qusta ibn Luqa, Masawaiyh, Patriarch Eutychius, Jabril ibn Bukhtishu etc.) and theology ( such as Tatian, Bar Daisan, Babai the Great, Nestorius, Toma bar Yacoub etc.) and the personal physicians of the Abbasid Caliphs were often Assyrian Christians such as the long serving Bukhtishu dynasty. Many scholars of the House of Wisdom were of Christian background. A hospital and medical training center existed at Gundeshapur. The city of Gundeshapur was founded in AD 271 by the Sassanid king Shapur I. It was one of the major cities in Khuzestan province of the Persian empire in what is today Iran. A large percentage of the population was Syriacs, most of whom were Christians. Under the rule of Khusraw I, refuge was granted to Greek Nestorian Christian philosophers including the scholars of the Persian School of Edessa (Urfa), also called the Academy of Athens, a Christian theological and medical university. These scholars made their way to Gundeshapur in 529 following the closing of the academy by Emperor Justinian. They were engaged in medical sciences and initiated the first translation projects of medical texts. The arrival of these medical practitioners from Edessa marks the beginning of the hospital and medical center at Gundeshapur. It included a medical school and hospital (bimaristan), a pharmacology laboratory, a translation house, a library and an observatory. Indian doctors also contributed to the school at Gundeshapur, most notably the medical researcher Mankah. Later after Islamic invasion, the writings of Mankah and of the Indian doctor Sustura were translated into Arabic at Baghdad. Daud al-Antaki was one of the last generation of influential Arab Christian writers. Arab Christians and Arabic-Speaking Christians especially Maronites played important roles in Al-Nahda, and because Arab Christians formed the educated upper and bourgeois classes, they have had a significant impact in politics, business and culture, and most important figures of the Al-Nahda movement were Christian Arabs. ^ a b Hämmerli, Maria; Mayer, Jean-François (23 May 2016). Orthodox Identities in Western Europe: Migration, Settlement and Innovation. Routledge. p. 13. ISBN 9781317084914. ^ Bulletin for the Study of Religion, Volumes 9-12. Council on the Study of Religion. 1978. p. 29. Since Eastern Christianity is difficult to define, or even to describe, the subject parameters of the proposed works will be somewhat open-ended. ^ This ecumenical creed is today recited in the liturgy of the Roman Catholic Church (both Latin and Eastern Rites), the Eastern Orthodox Churches, the Oriental Orthodox Churches, the Church of the East, the Moravian Church, the Lutheran Churches, the Methodist Churches, the Anglican Communion, the Reformed Churches, and other Christian denominations. Scharper, Philip J. (1969). Meet the American Catholic. Broadman Press. p. 34. It is interesting to note, however, that the Nicene Creed, recited by Roman Catholics in their worship, is also accepted by millions of other Christians as a testimony of their faith — Episcopalians, Presbyterians, Methodists, Lutherans, and members of many of the Reformed Churches. ^ Hindson, Edward E.; Mitchell, Daniel R. (1 August 2013). The Popular Encyclopedia of Church History. Harvest House Publishers. p. 225. ISBN 9780736948074. ^ a b Bebis, Vassilios (30 March 2013). "The Divine Liturgy of Saint John Chrysostom, used by the Ukrainian Lutheran Church, and its missing elements". Eastern Orthodox Metropolitanate of Hong Kong and Southeast Asia. Retrieved 18 September 2018. A revised Liturgy of St. John Chrysostom is also celebrated in Ukraine by members of the Ukrainian Lutheran Church. This Church was organized originally in 1926 in the “Galicia” region of Ukraine, which was at that time under the government of Poland. The liturgical rites used by the Ukrainian Lutherans reflected their Byzantine tradition. They did not use a Lutheran revision of the Latin Mass in their services, but instead they used a Lutheran revision of the Divine Liturgy of St. John Chrysostom. ^ Dushnyck, Walter (1991). The Ukrainian Heritage in America. Ukrainian Congress Committee of America. p. 94. ISBN 9781879001008. ^ "Ecumenical Patriarchate of Constantinople". Ecupatriarchate.org. Retrieved 2014-03-07. ^ Hyman and Walsh Philosophy in the Middle Ages Indianapolis, 1973, p. 204' Meri, Josef W. and Jere L. Bacharach, Editors, Medieval Islamic Civilization Vol.1, A-K, Index, 2006, p. 304. ^  "The historical march of the Arabs: the third moment." Julius Assfalg (ed. ), Kleines Wörterbuch des christlichen Orients, Wiesbaden 1975. Jenkins, Philip (2008). The Lost History Of Christianity. New York: HarperCollins. ISBN 978-0-06-147281-7. Eastern Catholics Information concerning Christians of Eastern rites who are in communion with, and under the jurisdiction of, the Pope, the Bishop of Rome. The Assyrian Church of the East, officially the Holy Apostolic Catholic Assyrian Church of the East, is an Eastern Christian Church that follows the traditional christology and ecclesiology of the historical Church of the East. It belongs to the eastern branch of Syriac Christianity, and uses the Divine Liturgy of Saints Mar Addai and Mar Mari belonging to the East Syrian Rite liturgy. Its main spoken language is Syriac, a dialect of Eastern Aramaic, and the majority of its adherents are ethnic Assyrians. Syriac Christianity is the form of Eastern Christianity whose formative theological writings and traditional liturgy are expressed in the Syriac language. The Liturgy of Saint James or Jacobite Liturgy is the oldest complete form of the Eastern varieties of the Christian liturgy still in use among certain Christian Churches. The Holy Qurbana or Holy Qurbono, the "Holy Offering" or "Holy Sacrifice", refers to the Eucharist as celebrated in Syriac Christianity. This includes various Oriental Orthodox and Eastern Catholic churches, including the Syriac Orthodox Church based in Syria, the Coptic Orthodox Church based in Egypt, the Maronite Catholic Church based in Lebanon, the Syriac Catholic Church based in Lebanon, the Syro-Malabar Catholic Church based in India, the Chaldean Catholic Church based in Iraq, the Ethiopian Orthodox Church based in Ethiopia, the Jacobite Syrian Orthodox Church based in India, and the Malankara Orthodox Syrian Church based in India. The East Syriac Rite is used in the Assyrian Church of the East based in Iraq as well, however they are not in official communion with Oriental Orthodoxy, and they are not a part of the Eastern Catholic churches. The Chaldean Syrian Church of India is an Eastern Christian Church based in Thrissur, India. It is an archbishopric of the Holy Apostolic Catholic Assyrian Church of the East and is in full communion with Patriarch Gewargis III, the Catholicos-Patriarch of the Assyrian Church of the East. Antiochene Rite or Antiochian Rite designates the family of liturgies originally used in the Patriarchate of Antioch. The term Reformed Orthodoxy is given to an attempted Protestant Reformation of the Orthodox Christian beliefs and practices of the Eastern and Oriental Orthodox churches. Presently the Ukrainian Lutheran Church, the Malankara Mar Thoma Syrian Church, St. Thomas Evangelical Church of India, the Believers Eastern Church, the Evangelical Baptist Union of Georgia, Society for Eastern Rite Anglicanism, Evangelical Orthodox Church, Assyrian Evangelical Church, and the Assyrian Pentecostal Church are revised according to Lutheran, Anglican, Baptist, Evangelical and Pentecostal Protestant reforms, respectively. The Church of the East, also known as the Nestorian Church and the Persian Church, was an Eastern Christian denomination that in 410 organised itself within the Sasanian Empire and in 424 declared its leader independent of other Christian leaders. From the Persian Empire it spread to other parts of Asia in late antiquity and the Middle Ages. The Latin Church is the largest particular church of the Catholic Church, employing the Latin liturgical rites. It is one of 24 sui iuris churches, the 23 other forming the Eastern Catholic Churches. It is headed by the Bishop of Rome - the pope, traditionally called the Patriarch of the West - with headquarters in the Vatican City, enclaved within Rome, Italy. The Latin Church traces its history to the earliest days of Christianity, according to Catholic tradition, through its direct leadership under the Holy See.